This article is about the spacecraft. For the TV series, see Pioneer One. For the land speed racer, see Pioneer 1 (land speed racer). Pioneer 1 was fabricated by Space Technology Laboratories, a division of Ramo-Wooldridge Corp (later TRW), and consisted of a thin cylindrical midsection with a squat truncated cone on each side. The cylinder was 74 cm (29 in) in diameter and the height from the top of one cone to the top of the opposite cone was 76 cm (30 in). Along the axis of the spacecraft and protruding from the end of the lower cone was an 11 kg solid propellant injection rocket and rocket case, which formed the main structural member of the spacecraft. Eight small low-thrust solid propellant velocity adjustment rockets were mounted on the end of the upper cone in a ring assembly which could be jettisoned after use. A magnetic dipole antenna also protruded from the top of the upper cone. The shell was composed of laminated plastic. The total mass of the spacecraft after vernier separation was 34.2 kg, after injection rocket firing it would have been 23.2 kg. The three-stage Thor-Able vehicle consisted of a modified Air Force Thor IRBM (liquid propellant, thrust about 153,000 pounds) as the first stage. A liquid-propellant rocket engine powered the second stage (modified Vanguard second stage, thrust about 7500 pounds). The third stage was a solid-propellant unit based on Vanguard design, rated at 116,500 lb*sec total impulse. The scientific instrument package had a mass of 17.8 kg and consisted of an image scanning infrared television system to study the Moon's surface to a resolution of 0.5 degrees, an ionization chamber to measure radiation in space, a diaphragm/microphone assembly to detect micrometeorites, a spin-coil magnetometer to measure magnetic fields to 5 microgauss, and temperature-variable resistors to record the spacecraft's internal conditions. The spacecraft was powered by nickel-cadmium batteries for ignition of the rockets, silver cell batteries for the television system, and mercury batteries for the remaining circuits. Radio transmission was on 108.06 MHz through an electric dipole antenna for telemetry and doppler information at 300 mW and a magnetic dipole antenna for the television system at 50 W. Ground commands were received through the electric dipole antenna at 115 MHz. The spacecraft was spin-stabilized at 1.8 rps, the spin direction was approximately perpendicular to the geomagnetic meridian planes of the trajectory. Two days after the failure of Pioneer 0 on August 17, Thor 129, the backup vehicle, was erected on LC-17B in preparation for a September attempt. The postflight investigation of Pioneer 0 pointed to a turbopump failure, which had also caused the loss of Thor-Able 116 in April. This was followed by the failure of an Atlas launch on September 18, so the Air Force moved to replace the turbopumps in their inventory of Thor and Atlas missiles. Thor 129 was pulled from the pad for modifications and replaced with Thor 130. On October 11, Pioneer 1 lifted off smoothly, but the guidance system steered the Thor slightly too high and fast, causing the second stage to be lofted 3° higher than intended. As a result, it shut off 10 seconds earlier than planned, and also bumped the third stage during separation. The third stage was left pitched up about 15° and suffering a velocity shortfall of about 500 feet per second. The vernier engines on the third stage were fired to make up for the thrust deficit, but added only 150 feet per second of velocity, insufficient to escape Earth orbit. As a last resort, ground controllers decided that if they could not get Pioneer 1 to the Moon, they would place it in a high Earth orbit by firing the attached solid rocket motor. The inaccurate launch trajectory, however, had placed the probe on an orbital track that resulted in thermal heating and cooling beyond what the primitive temperature control system could handle. The probe's internals fell to near freezing temperatures, rendering the solid motor igniter inoperable. Pioneer 1 reached a total distance of 71,100 miles (114,400 km) before beginning its descent back to Earth. 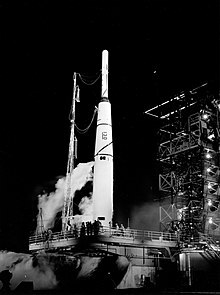 The spacecraft was launched from LC-17A at 08:42:00 UTC on October 11, 1958 but it did not reach the Moon as planned due to a programming error in the upper stage causing a slight error in burnout velocity and angle (3.5 deg.). This resulted in a ballistic trajectory with a peak altitude of 113,800 km (70,712 mi) around 13:00 local time. The real-time transmission was obtained for about 75% of the flight, but the percentage of data recorded for each experiment was variable. Except for the first hour of flight, the signal-to-noise ratio was good. The spacecraft ended transmission when it reentered the Earth's atmosphere after 43 hours of flight on October 13, 1958 at 03:46 UT over the South Pacific Ocean. A small quantity of useful scientific information was returned, showing the radiation surrounding Earth was in the form of bands and measuring the extent of the bands, mapping the total ionizing flux, making the first observations of hydromagnetic oscillations of the magnetic field, and taking the first measurements of the density of micrometeorites and the Interplanetary Magnetic Field. ^ a b Due to a cataloguing error the spacecraft was assigned Harvard designation 1958 Eta 1 and satellite catalogue number 110 despite never achieving orbit. ^ "1958 NASA/USAF Space Probe (ABLE-1) Final Report: Volume 2. Payload and Experiments" (PDF). Space Technology Laboratories. February 18, 1959. Retrieved February 17, 2009. ^ "Pioneer 1 - NSSDC ID: 1958-007A". NASA NSSDC. ^ Rosenthal, Alfred. "A record of NASA space missions since 1958". NASA. NASA Technical Reports Server. Retrieved 24 September 2011. ^ "Moon Rocket Falls, Burns Up; Plunges Back Into Atmosphere". Pittsburgh Post-Gazette. Associated Press. October 13, 1958. p. 1. Retrieved March 7, 2011.